Delicious and fun vegan food recipes from many cultures. Straightforward information about healthy cooking practices. Advantages and ease of vegan, organic, raw, and detox diets. An extensive glossary of food products, ingredients, and resources. "Rainbow Fusion" cooking that supports health and spiritual practice. Vegan Inspiration is so much more than a recipe book for meals. It is also a recipe book for conscious living. Written during this time of planetary awakening, vegan chef Todd Dacey and "Food Goddess" Jia Patton shine a bright light upon our path. Among the amazing, delicious, healthy, and cruelty-free meals, we find gems about both spiritual and physical healing and wisdom In the book, we find a treasure of information about acid/alkaline balance, cleansing of toxins, fats, vegan food, raw food, fasting, and even a great shopping list to help us stock our kitchens with health producing ingredients. One of the most fascinating sections is about high vibration foods. Beyond those gifts, the authors share their personal stories of transformation and their beautiful vision of a world fed and blessed with love, nonviolence, and respect for all life. 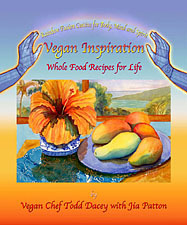 Vegans will find a wealth of recipe ideas and spiritual inspiration. Non-vegans and vegans-to-be will find reasons for adopting an ahimsa (nonviolent) lifestyle that, perhaps, they had never read before. Just paging through the book, we sense the absolute peacefulness and joy that Todd and Jia experience and want to share with their readers. I highly recommend this book to everyone who eats and everyone who wants peace and joy in their lives. Rough grind nuts in a food processor. Mix all ingredients together in a bowl and evenly distribute over the apple mixture. Bake for 30 to 35 minutes or until bubbling and lightly browned. Cool before serving.